do you continue with the conversation? Do you ask what they have been up to? Or if it's you do you feel the urge to explain how you've been busy? I find myself having this same conversation. Whether it's in the school office with the secretaries, at church with my second family, my friends who I haven't seen in a few days (um who are we kidding, I don't see them for weeks! ), or even my family! Busy! 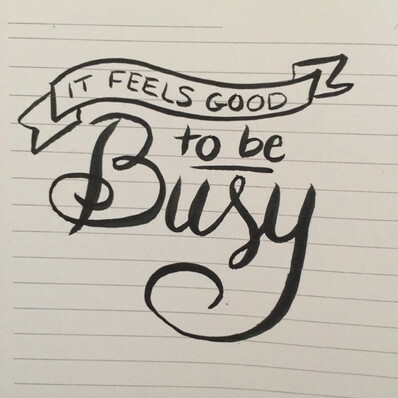 Why do we seem to share with everyone that we are always busy? I know I am busy, my calendar will prove it to you. There's days on there that I have to draw arrows because our activites won't fit in the square! But, everything that is on there I agreed to do. I agreed to let all 3 kids play soccer, I agreed to support my oldest in being a youth group officer, I agreed to be apart of the church in a bigger part then just Sundays, I agree to be the PTA president, I agree to volunteer in the school and years ago I agreed to resign my teaching position to stay at home with the kids and manage the household. So, if we agree to everything that goes on in our lives, why do we use it so people feel sorry for us. My best friend and I talk a lot about how life was different when we were younger (I've said before, I've been best friends with her since we were in kindergarten. So we can talk about life back then!). I myself was a competitive gymnast practices 4-5 nights a week for 3 to 4 hours at a time. I also was a dancer with rehersals on Saturdays and once during the week. I was never home! Both my brothers played sports including travel soccer. So we were busy, but when I think back I don't remember life as crazy and chaotic as mine is now! This kind of goes back to my last post, about being grateful. I should be happy and thank God for my kids and family for keeping me on my toes. I should be grateful I have my health to work, volunteer and enjoy life, as crazy as it gets! So maybe when I'm asked that questions the next time, I should answer honestly. "Hey Kerry, how are you?" "I'm good! Blessed, thankful and happy!"